Synthetic Phonics - A New Approach? Do Young Children Need Computers? She discovered that movement needs to be ‘…guided by the intellect’; movement not for movement’s sake, but purposeful movement. After the initial 1963 classic study by Held and Hein many more pieces of research began to explore the impact of grasping and also crawling on babies’ brain development. These studies found that the more active the infant was in exploring the environment with their hands, the more advanced they were in their ability to perceive object boundaries. Recent research with monkeys and adult humans have also found that we respond to what we can interact with, and once babies reach for objects, we can see that they become capable of interacting with their environment; the earlier they start to reach, the earlier their cognitive abilities mature. This interaction, it was further proved, also increased their interest in and knowledge of the physical world around them and also interestingly, their mental world, i.e. being able to share other peoples’ experiences. When he is just newly born, hang a beautiful mobile that moves gently with any passing current, so that his eyes can track the outlines of the abstract shapes and colours. The joy in the child is self-evident when we watch him perform what to the adult seem like ‘chores’ around the house. Such practical, meaningful activities help him feel like [and so he becomes] a responsible and contributing member of the family; little does he know that every opportunity set, allows his intellectual life to flourish in the form of the ‘I think and then I do’ process. The recent claims that ‘synthetic phonics’ hold the key to transforming literacy levels in the UK is far from news to those familiar with the approach to language found in a Montessori Children’s House. Sarah Emerson looks at what is meant by this term and how far the Montessori Approach goes to fulfilling the recommendations of the recent research into literacy. The recent claims that synthetic phonics hold the key to transforming literacy levels in the UK is far from ‘news’ to those familiar with the approach to language found in a Montessori Children’s House. Phonetic reading involves decoding words into their component sounds. To do this, the child needs a thorough knowledge of the sounds of his language and of the symbols (graphemes) for each sound. The research in support of phonics is overwhelmingly convincing. 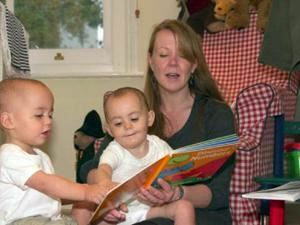 The Johnston and Watson (2005) report showed that children taught using synthetic phonics could read and spell seven months ahead of the norm, and this level of achievement was sustained by the children involved over a number of years. The key to the success of synthetics phonics is that in learning how to recognise and blend sounds, the child acquires a skill that he will be able to use whenever he encounters a new word in the future. Angeline Lillard, Professor of Psychology at the University of Virginia and author of the award winning book Montessori: The Science Behind the Genius writes about the preponderance of non Montessori materials that she sees in many Montessori environments and considers the effect that these materials may be having on the effective application of the Montessori approach. Over the past five years I have visited scores of Montessori classrooms, most of them in the US and Canada. Many commonalities were observed. For example, in almost every one, children usually freely choose their activities, and engage hands-on with material objects. They take care of the environment, wiping up their own spills, and dusting and sweeping. And there are always identifiable Montessori materials, like the Pink Tower and the Metal Insets, on low shelves spread throughout the room. Where the variety comes in most strikingly is in the preponderance of other materials that are available and in use. What might the presence and use of these alternative materials mean for the children and their education and development? We cannot know the answer short of controlled studies, but I think the issue warrants deep consideration. The Montessori materials have an interesting history. The initial ones were developed by Seguin for working with mentally retarded children, and were adapted by Montessori in the early 1900s. From there she modified the originals and added to them. My impression, from her books and from conversations with people who have access to unpublished lectures and have spent time with people who worked directly with her, is that tremendous thought and experimentation went into the development of these materials and their use. The Pink Tower, for example, is not merely a tower of blocks of increasing size, but instead is a carefully calculated instrument to educate the senses and the motor system, and to implicitly introduce the decimal system and the notion of cubing. Each block is one centimetre longer on all sides than the one that came before, and there are ten such blocks going from one cubic centimetre to ten. The increasing size is reflected not only visually but also haptically and barically: each block is heavier by an exponentially increasing magnitude. I do not know why it is pink, rather than blue or green; perhaps it was simply the color paint the carpenter had on hand that day, but given the thought that went into the other aspects and some other materials perhaps it was not chosen randomly. The child uses the Pink Tower in a specific way: carrying each cube to a rug, and then reassembling the tower from memory, from largest to smallest cube, carefully centering each subsequent cube over the preceding one. 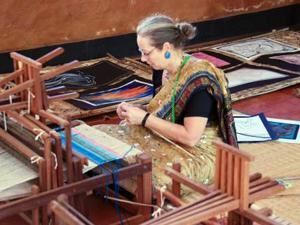 The material is treated with great care; the teacher is to intervene when materials are handled roughly. When finished, the tower is admired then carefully dissembled [in the early days it was knocked down, but this was a rough use of the material] and returned to its original location. Dr. Montessori watched children in the classroom and thought about their developmental needs; she developed materials that she thought would suit those needs; and she then watched the children with the materials, and revised and refined them until she thought she had a material that would meet one or more specific needs. So for example there are ten Metal Insets, not thee or fifteen, because she found that different numbers did not entice the child’s interest in the same way. To get the children to engage and stay engaged with the Metal Insets—and thereby learn concentration and to hold and handle a pencil and the names of the ten shapes and to experiment with colour and design—she found they needed ten. 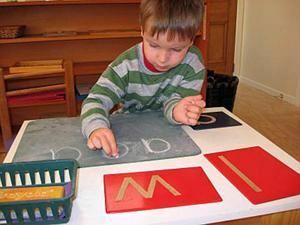 The Sandpaper Letters are cursive because Dr. Montessori saw it as easier for beginning writers to keep the pencil on the paper, flowing from one letter to the next, rather than stopping and beginning again for each new letter. And so on: the choice of materials was very intentional, and those who spent the most time with Dr. Montessori or her immediate contacts can offer an endless stream of the many considered and purposes for each of the materials. Not only does each material have many purposes, but there is also little redundancy across the materials, and redundancy is highly intentional where it exists: for example, there are many small knobs to assist development of the pincer grip because it is considered so important to develop. But given a set of Metal Insets for holding and handling a pencil and following a specific line, there was no perceived need for stencils or other objects for that purpose. With Red Rods to exercise working memory (the amount of information one can hold in mind at once), by having the child walk across the room to retrieve from a pile the rod just longer or shorter than the one just placed, one did not need the game of Memory in the classroom. In addition, each material was developed in the context of all the other materials. The Solid Cylinders [or Solid Insets] set in motion thinking about changes in dimension, leading to the Pink Tower with three dimensions changing [three being easier to perceive than two], then the Brown Stair with two, then the Red Rods with just one. And the Red Rods would lead into math in the context of what came before (just mentioned) and after (Red and Blue Rods). Mastering the pencil with the Metal Insets set the child up for writing in the context of the child having also learned how to form the letters and knowing what they represent. This knowledge was conferred through use of the Sandpaper Letters. The Metal Insets without that other supporting material would not lead to writing. And so on. By design the materials have this complex interweaving nature, so one material feeds into or plays off of another. Dr. Montessori developed a specific set of materials to work together not only within the classroom, but also across classroom levels. The set within each classroom was intended to be about the right size set for a child to master in about three years in the classroom [or six years in Elementary for the full program]. And the materials the child would see in the next classroom not only referred to the materials in the earlier classroom [or was even the self-same material, used in a more complex way], but also required the understanding conferred by that earlier material. In sum, then, the original set of materials, as it had evolved by her death in 1952, comprised a specific set of materials for each classroom level, carefully designed to confer specific understandings through repeated use and in the context of other materials, selected to avoid most redundancy, and quantified to allow mastery in about three years in a classroom. As Montessori has evolved, we might say two courses have been taken. One course has been to keep very much to Dr. Montessori’s sets of materials [at each classroom level], with few changes; for lack of a better word I will call this the Traditional approach. The second approach, which I will call the Modified Montessori approach, has been to adopt modifications in a democratic fashion, with each teacher trainer and teacher making decisions about new materials to add to the set [or in cases what to take out]. Some of the added materials are readily available commercially and are not special to Montessori [puzzles]; others are presented at and sold at Montessori teacher conferences or are in Montessori catalogues. The result after some fifty years of this is a wealth of alternative materials in many Montessori classrooms, materials in whose creation Dr. Montessori did not have a hand or mind. What are some of these materials, and what might be the consequences of their inclusion in the classroom? One common category of modified materials I see is puzzles, games, and crafts projects. Children might be on the floor with a large puzzle of different animals from all over the world, or of planets of the solar system, or just a fantasy puzzle or a tangram. Or they might be playing the game of Memory or chess, or making valentines or collages from magazines. 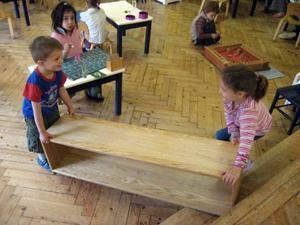 Children are often very engaged in such activities, and in classrooms that offer a lot of them, I have seen 90% of the children doing such activities while the Montessori materials gather dust in the corners. Because of the popularity of such materials for the children, a teacher trying to ‘Follow the child’ might well decide to put in more. Why are children preferring these materials, and what is the impact? For the why, I am not sure. Perhaps it is because they are familiar; perhaps it is because it is what they see other children doing. Something I also wonder about is whether the teachers are not conferring to the children the sense that the Montessori materials are very, very special. In classrooms where children use the Montessori materials, teachers appear to present them as if they were presenting something magic, and the teachers also take great pains to encourage the children to strive for perfection in their every movement—not only in how they handle these special objects, but also in how they walk across the room, push in a chair, and so on. There is a level of attention to detail—keeping the pencils sharp, keeping objects straight on the shelves—in the teachers that seems to be inherited by the children that inspires an attitude to the material that goes along with its use. Maybe that is a difference in classrooms where children gravitate to the materials. What are some of the impacts on the child of using other materials instead of Montessori ones? Consider the puzzle. Puzzles engage the hand, but do so in a very different way than many of the other activities Montessori designed. They teach spatial relations, redundant with other materials, like the Puzzle Maps, which also teach geography. The child learns to trace the Puzzle Map pieces first with their finger and then with a pencil as they recreate the maps on paper. Movement is aligned with cognition. And the child learns a fixed set of relations: France is always by Spain. This is not the case with many other puzzles; for example, in a puzzle of animals, each animal’s appearance next to another animal might be arbitrary [giraffes next to polar bears, for example]. Children do not appear to be learning the animals by learning their shapes, because I never see them trace the outlines of these puzzle pieces—and besides, unlike countries, animals change shape when they move. So what children are learning from these other puzzles is more limited. And by doing those puzzles instead, children are not learning the geography they could be building on later as they advance to other materials. Another category is materials that the Traditional group would place at different levels, the 0-3 or the Elementary classroom: colorful wooden pegs in a board with holes, or a model of the solar system. Clearly there needs to be allowance for children to have materials from a higher or lower level when needed, for example class size regulations might keep a child back. But sometimes I think teachers include materials from other levels not to meet the needs of an individual child but to enhance the Traditional set of materials. There are also cases of materials that do belong in the classroom but in which they are being used by children who are too old: for example, a 5-year-old just learning their Sandpaper Letters. Sometimes there would be good reasons for this, but in some classrooms with lots of modified materials my sense is that the children were busy doing puzzles at three and four, so the teacher is trying to get some letters in before the child leaves the classroom. But if feeling sandpaper is more engaging at three than at five (is it? ), the teacher has created a challenge to interest, a problem which goes back to the presence of puzzles in the classroom earlier but is coming out in age-inappropriate targeting of materials. Sometimes changes can have consequences far down the line, consequences that might not be anticipated early on. Yet another category of modification is alternative Practical Life materials. Practical Life is of course not set in stone: teachers are supposed to design their own Practical Life activities. But what I see very commonly is that the importance of the ‘Practical’ has been forgotten. Practical Life activities were intended by Dr. Montessori to have a practical purpose in care of the self, community, and environment. In the first Children’s House, children were taught to bathe themselves, not a doll; they then went around the classroom and really cleaned what needed cleaning. As she wrote in Dr. Montessori’s Own Handbook whereas some children have a toy kitchen in which to pretend to cook (and so on), ‘This method seeks to give all this to the child in reality—making him (sic) an actor in a living scene’. Still today, the child washes a table in the classroom because the tables do need washing. The child polishes his or her own leather shoes, so they will look shiny and nice. The child arranges lovely flowers and sets them around the room for beautification, waters real plants for their sustenance, irons napkins and makes muffins for snack, and so on. Real, true purposes. The main exception to this is the Dressing Frames: we don’t normally button up cloths in wooden frames. The reason for making this exception was well-considered: it is difficult for small hands to learn to button, zip, and tie. It is often hard to reach and manipulate these objects on one’s own clothes, and another person might not willingly stand as a model for the time it might take a beginner to accomplish the task—even were their buttons and zippers easy enough to reach and work. The Dressing Frames give the child a place to analyse and practice the movements needed for actual work with clothes. But very few activities require special apparatus like the Dressing Frames. Modified Practical Life activities are ones that do not reflect what we actually do: polishing a model shoe instead of the shoe one wears, lifting cotton balls with tongs and moving them from one jar to another [one might use tongs with ice or olives, but not cotton balls! ], using a dropper to move liquids from one vessel to another for no purpose other than the movement, hammering plastic nails into clay—why? We do not know whether children of three to six years of age detect the difference between polishing their own shoes and a model shoe, or have a different sense about grating soap simply to practice grating versus grating cheese for a pizza they will make. But one would expect they do: children begin to form action plans at a very early age, and Practical Life without a further purpose is like an isolated part of an action plan, like a factory worker who is only allowed to put in one screw over and over and never see the whole. The question arises as to whether children in classrooms where Practical Life activities serve a practical purpose engage in their work with more heart than in classrooms where they reflect this modification? Finally, there is the category of using materials for purposes for which they were not intended. For example, I have seen children combine the Brown Stair with the Knobless Cylinder to make towers, take animals from Language Boxes, ignoring the language cards, and make the animals converse and play, and use the Red Rods as guns. Is this kind of play with materials okay or not? As I discussed in Chapter 5 of Montessori: The Science Behind the Genius, there is research suggesting it would not be: that children who used the animals as toys, for example, would have more trouble making the symbolic link to their representation of a real animal as denoted by the language card. Seeing elements of the Brown Stair as a pillar of a building would cloud the child’s capacity to see it as one of a series of similar objects of gradually changing dimension. Related to this are modifications that involve using the materials in non-standard ways, for example, having the Long Bead Chains go in a circle. What does it do to the child’s understanding of skip counting when the chain circles rather than extends? Does it change it? I would suspect so, based on research in cognitive psychology showing how our spatial metaphors map to our understandings. For example, if I say, ‘Let’s move the meeting back a few days’ whether you take this to mean ‘farther into the future’ or ‘nearer to the present time’ will depend on whether you have been primed to think about yourself moving. Representations of space profoundly influence thought, and it might not be the same exercise to put a bead chain in a circle as to extend it in space. 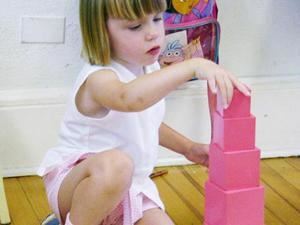 Likewise, to make the Pink Tower from a picture of a Pink Tower might not be the same as remembering what the Pink Tower should look like—it surely is exercising different skills. What do all these modifications mean for Montessori? Research is clearly needed, but the issues deserve discussion now. When one puts a new material in the classroom, has one given it the same degree of consideration that Montessori made in coming up with the Traditional set? For store-bought materials, did the designer give it the same degree of consideration as Dr. Montessori gave the materials that were in her core set by the end of her life? How does the new material fit the set already in the classroom? What other material should the child use less of, now that there is an additional material to use? How might the skills learned with the new material overlap with those gleaned from using other materials? How do these new materials fit into the sequences laid out by Montessori? Another issue to consider is that certain of the modified materials obscure what is unique about a Montessori classroom, since most preschool classrooms offer puzzles, games, and crafts. If children mainly engage with these sorts of activities rather than the Montessori materials, then what makes Montessori unique, what makes it Montessori? Does it all come down to the free choice [which many preschools have to some degree] and the presence of the Montessori materials even if they are not used? To what degree does a Montessori education come from repeated use of the materials, and to what degree is it only about a teacher’s attitude towards and treatment of the children? This article was previously published in Montessori Life and is printed by kind permission of the author. Governments everywhere are pushing computer literacy and use in classrooms. We are fed the arguments that computers improve both teaching practices and student achievement. There is an urgency to their demands that computer literacy should be taught as early as possible, to 3 year olds; in order that children are ready to become tomorrow's work force in an increasingly high-tech world. The educational psychologist Jane Healy spent years doing research into computer use in schools, and expected to be blown away by how children’s learning had been enhanced by computer use. She found exactly the opposite, and was dismayed by the lack of research, and how children’s use of so-called educational software showed dubious value for learning. While she remains positive about some forms of computer use for older children, Healy is upset that preschoolers are being urged to log on. She feels strongly that ‘time on the computer might interfere with development of everything from the young child's motor skills to his or ability to think logically and distinguish between reality and fantasy’. Her book Failure to Connect: How Computers Affect Our Children’s Minds for Better and Worse, is an objective look at both the benefits and problems of computer use at home and in school, and their impact on children’s health, creativity, brain development, social and emotional growth. 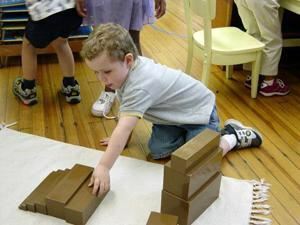 Montessori talked about the ordering that takes place in the first 6 years, during which the child works to create the mental structures and classifications into which to sort all the impressions that he is absorbing. Computer scientist David Gelernter says that instead of bombarding children with more information through internet access, we need to help them develop the ability to intellectually manage such complex data pools. He maintains that children need less surfing, as they already have more data than they know how to handle: ‘Virtually everything the Internet is selling, our children already have too much of and are choking on. What they most need’, he says, ‘is persistence, concentration and careful analysis, none of which they will learn by surfing the Internet. It is striking how people who have achieved immense success in the technological field – innovators and pioneers of new forms of computer use – come from a Montessori background, where they did not use computers in their early childhood experiences. Even more striking, when we look at the work of such Montessori graduates as Jeff Bezos (the founder of Amazon), Jimmy Wales (founder of Wikipedia), Sergey Brin and Larry Page (founders of Google) is how their advancements seem to reflect their childhood experience of ordering, sorting, searching through and classifying information. Only now they are doing it on an immense scale, and have designed ways of helping other people to do the same. According to Google lore, Larry Page and Sergey Brin, co-presidents of Google, were not very fond of each other when they first met as Stanford University graduate students in computer science in 1995. They soon found a common interest: retrieving relevant information from large data sets. On the Barbara Walters ABC-TV Special “The Ten Most Fascinating People of 2004’ Larry Page and Sergey Brin, credited their years as Montessori students as a major factor behind their success. They said that it was going to a Montessori school where they learned to be self-directed and self-starters; that Montessori education allowed them to learn to think for themselves and gave them freedom to pursue their own interests.Will Wright, designer of the groundbreaking computer game The Sims, has said ‘Montessori taught me the joy of discovery...It showed you can become interested in pretty complex theories, like Pythagorean theory, say, by playing with blocks. It’s all about learning on your terms, rather than a teacher explaining stuff to you. SimCity comes right out of Montessori—if you give people this model for building cities, they will abstract from it principles of urban design.’It is thought-provoking that even in such a field as computer games, which have a reputation for being violent, war-oriented, and competitive, a former Montessori child instead develops a game oriented towards building a community. Will Wright’s actual TED speech included an introduction of how his own Montessori education was ‘the high point of my education’. He reports that when he became a computer game designer he became very interested in Maria Montessori and her method, how she ‘found very valuable for kids to discover things on their own rather than being taught these things overtly. She would design these toys where kids in playing with the toys would actually come to understand these deep principles about life and nature through play. And because they had discovered these things it really stuck with them so much more. And also they would experience their own failure . . . that was very important. So the games that I do I really think of more as modern Montessori toys. And I really want them to be presented in a way more where kids explore and discover their own principles.’ To the Montessori community, that sounds pretty familiar!